Back in June, I managed to corral the Professor, both twins, and Sadie the dog to go to Assiniboine Park for a few minutes on a Saturday afternoon. 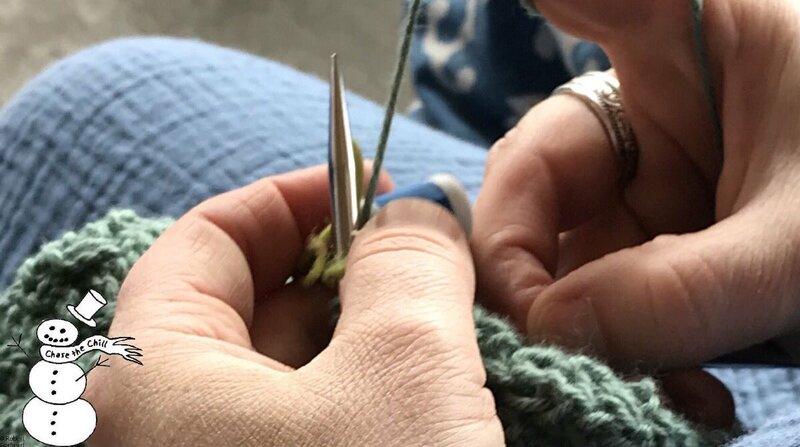 I am usually spending time with my family and going to services on Saturdays when we can pull it off, but that day--It was a chance to support Knit In Public Day --which is hosted locally by Chase the Chill, a Winnipeg knitting charity which I think is fantastic. Chase the Chill provides handknit scarves to Winnipeggers in need, once a year. All year long, people knit for Chase the Chill's annual event. It happens in early December, when it is already plenty cold here. It's simple. The folks who run it go out with some helpers, and tie all those handknit scarves all over the trees in one downtown park with notes. The notes say who knit the scarves, and invite people to take and wear the scarves to stay warm. Thanks for coming out to #wwkipday2018 ! Thanks so much to Chase the Chill for connecting with local designers--and featuring us! I so appreciate it...and of course, I appreciate what you do all year as you knit for cold Winnipeggers, too.